Alex is 9 years old. This is her third year deer hunting, her second deer, and her first buck! She took a button buck her first year on HSP property. 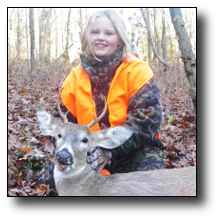 She harvested this deer on Sunday morning of the youth rifle season, at about 8AM. We had just seen two does, but she was holding out for something with horns. She actually called one of the does in to about twenty yards of us 3 times with a Primos can call. It was pretty funny just being able to let her do that and see the way the deer reacted. I think it actually calmed her nerves a little bit being able to watch them with no pressure to get off a shot. About 15 minutes after they left, this buck came up the creek and was actually going to turn around and go back the way he came when she shot. The shot was about 125 yards through the woods. I was not sure she hit it or how well she hit it so we waited a "long" 15 minutes. We then went down to the spot we had marked where he was standing and did not find any blood. We walked about 20 yards in the direction he went and I had my head down looking for blood when she spotted him lying in the creek. He ran about 60 yards. The shot was near perfect right behind the front shoulder. I bought her a new rifle this year….it is a Remington model 700 youth in a .243 with a Nikon 3x9 scope. It fits her and she shoots it well, which is important. We were also in a pop-up ground blind. She called in about a 140" 8 point to about 25 yards the morning before with that can call. We were sitting on a pond bank and he walked to us in the only spot she had no shot. He gave us a show by grunting, rubbing a tree and making a scrape right in front of us but finally got nervous and turned and bounded down the hill. Her gun was on her shooting sticks and she was shaking so bad I could hear the vibration of the gun against the stick. Her only comment after he left was "I think I'm going to throw up". It is cool to see your kid, even at that young of an age, get so shook up over a deer. I would rather take her than go myself now.